The Market at Gus’s started as a small boutique seafood market and has operated that way during the last 20 years. Today we have updated the market to be more than just a seafood destination. The customer demand for a fresh market with more product lines influenced us and is why The Market at Gus’s is now a full gourmet market. The Market at Gus’s carries prime meats, fresh seafood, produce, grocery items, prepared foods, and also features a gourmet deli. The Market buys directly from farmers and fishermen, which allows us to go straight to the source to ensure that you have the freshest ingredients on your plate. 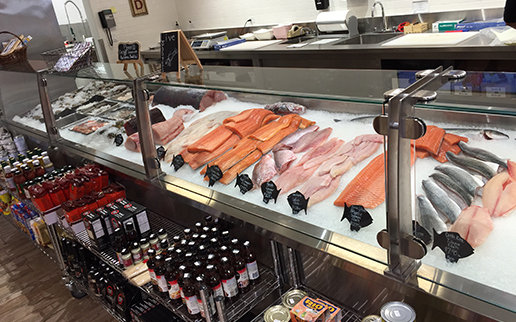 If it’s not the freshest seafood available, it’s not in The Market at Gus’s cases. Our selection of seafood is second to none. We offer a large variety of fresh seafood that is perfect for any occasion. Our staff takes special care in making sure our quality and presentation is what you would expect from The Market at Gus’s. We have everything from fresh Oysters, Stone Crab Claws (seasonal), Live Maine Lobster, Clams, Mussels, Scallops, Cod, Sea bass, Swordfish, Tilapia, farm raised, Atlantic Salmon, Wild Alaskan Salmon (Seasonal), Grouper, fresh Shrimp, Snapper, Sushi Grade Tuna and of course imported and American Caviar, to name just a few seafood items! Our Seafood Department is knowledgeable and well-trained to give you the perfect portion you desire and can even offer cooking ideas. Our seafood arrives daily ensuring the highest and freshest quality. We take great pride in our seafood and we know The Market at Gus’s will exceed your expectations when you shop with us.